Berkshire County is a non-governmental county located on the western edge of the U.S. state of Massachusetts. As of the 2010 census, the population was 131,219. Its largest city and traditional county seat is Pittsfield. 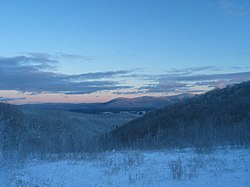 The Berkshire Hills are centered on Berkshire County, and the county itself is often referred to simply as "the Berkshires". Of the fourteen Massachusetts counties, Berkshire County is one of seven that exists today only as a historical geographic region, and has no county government. All former county functions were assumed by state agencies in 2000. The sheriff and some other regional officials with specific duties are still elected locally to perform duties within the county region, but there is no county council or commissioner. However, communities are now granted the right to form their own regional compacts for sharing services. The towns of Berkshire County have formed such a regional compact known as the Berkshire Regional Planning Commission. Berkshire County has three (3) Registry of Deeds Districts, Northern, Middle, and Southern. Berkshire Northern District is located in Adams, MA and records for the city of North Adams and the towns of Adams, Cheshire, Clarksburg, Florida, Hancock, Lanesborough, New Ashford, Savoy, Williamstown and Windsor. Berkshire Middle District is located in Pittsfield MA and records for the city of Pittsfield and the towns of Becket, Dalton, Hinsdale, Lee, Lenox, Otis, Peru, Richmond, Stockbridge, Tyringham and Washington. Berkshire Southern District is located in Great Barrington, MA and records for the towns of Alford, Egremont, Great Barrington, Monterey, Mount Washington, New Marlborough, Sandisfield, Sheffield and West Stockbridge. County Sheriff: Carmen C. Massimiano, Jr.
, a primarily rural district that makes up most of Western Massachusetts. The General Court of Massachusetts is the state legislature of the Commonwealth of Massachusetts. The name "General Court" is a hold-over from the Colonial Era, when this body also sat in judgment of judicial appeals cases. Before the adoption of the state constitution in 1780, it was called the "Great and General Court," but the official title was shortened by John Adams, author of the state constitution, apparently in the name of republican simplicity. It is a bicameral body. The upper house is the Massachusetts Senate which is composed of 40 members. The lower body, the Massachusetts House of Representatives, has 160 members. Berkshire County has four (4) districts and elected Representatives in the Massachusetts House of Representatives. First Berkshire. - Consisting of the towns of Adams, Clarksburg, Florida, North Adams, Savoy and Williamstown, all in the county of Berkshire; and the towns of Charlemont, Hawley, Heath, Monroe and Rowe, all in the county of Franklin. Daniel E. Bosley (D), is the current Representative. Second Berkshire. - Consisting of the towns of Becket, Cheshire, Dalton, Hancock, Hinsdale, Lanesborough, New Ashford, Peru, Richmond, Washington and Windsor, and precinct B of ward 1, of the city of Pittsfield, all in the county of Berkshire; the towns of Ashfield, Bernardston, Buckland, Colrain, Leyden, Northfield and Shelburne, all in the county of Franklin; and the towns of Cummington, Middlefield and Plainfield, all in the county of Hampshire. Denis E. Guyer (D), is the current Representative. Third Berkshire. - Consisting of precinct A of ward 1, all precincts of wards 2, 3, 4, precinct A of ward 5, and all precincts of wards 6 and 7, of the city of Pittsfield, in the county of Berkshire. Christopher N. Speranzo (D), is the current Representative. Fourth Berkshire. - Consisting of the towns of Alford, Egremont, Great Barrington, Lee, Lenox, Monterey, Mount Washington, New Marlborough, Otis, precinct 5B of the city of Pittsfield, the towns of Sandisfield, Sheffield, Stockbridge, Tyringham and West Stockbridge, all in the county of Berkshire; and the towns of Blandford, Chester and Tolland, all in the county of Hampden. William Smitty Pignatelli (D), is the current Representative. Berkshire County is located in one (1) district for the Massachusetts Senate. The district consist of all of Berkshire County and the following cities: Chesterfield, Cummington, Goshen, Huntington, Middlefield, Plainfield, Westhampton, Williamsburg and Worthington, in the county of Hampshire; and Ashfield, Charlemont, Conway, Hawley, Heath, Monroe and Rowe, in the county of Franklin. Benjamin B. Downing (D), is the current Senator. The Massachusetts Governor's Council, also known as the Executive Council, is composed of eight individuals elected from districts, and the Lt. Governor who serves ex officio. The eight councillors are elected from their respective districts every two years. Berkshire County is located in the 8th District. The Council generally meets at noon on Wednesdays in its State House Chamber, next to the Governor's Office, to act on such issues as payments from the state treasury, criminal pardons and commutations, and approval of gubernatorial appointments; such as judges, notaries and justices of the peace. See also the League of Women Voters of Massachusetts page on counties. According to the 2000 census, the county has a total area of 946.27 square miles (2,450.8 km2), of which 931.32 square miles (2,412.1 km2) (or 98.42%) is land and 14.95 square miles (38.7 km2) (or 1.58%) is water. The highest natural point in Massachusetts, Mount Greylock at 3,492 feet (1,064 m) is located in Berkshire County. Berkshire County is one of two Massachusetts counties that borders three different neighboring states; the other being Worcester County. The two counties are also the only ones to touch both the northern and southern state lines. Running north-south through the county are the Berkshire Hills in the eastern part of the county and the Taconic Mountains in the western part of the county. They are a source of pride for their beauty, attract many tourists and summering residents, and have marked the county's character. As of the census of 2000, there were 134,953 people, 56,006 households, and 35,115 families residing in the county. The population density was 145 people per square mile (56/km²). There were 66,301 housing units at an average density of 71 per square mile (27/km²). The racial makeup of the county was 95.02% White, 1.99% Black or African American, 0.15% Native American, 0.99% Asian, 0.04% Pacific Islander, 0.59% from other races, and 1.23% from two or more races. 1.69% of the population were Hispanic or Latino of any race. 16.5% were of Italian, 16.4% Irish, 10.8% French, 10.3% English, 8.0% Polish, 7.1% German, 5.8% American and 5.1% French Canadian ancestry according to Census 2000. 94.1% spoke English, 1.6% Spanish and 1.1% French as their first language. There were 56,006 households out of which 27.50% had children under the age of 18 living with them, 48.00% were married couples living together, 11.00% had a female householder with no husband present, and 37.30% were non-families. 31.60% of all households were made up of individuals and 13.90% had someone living alone who was 65 years of age or older. The average household size was 2.30 and the average family size was 2.89. In the county the population was spread out with 22.40% under the age of 18, 8.40% from 18 to 24, 26.40% from 25 to 44, 24.90% from 45 to 64, and 17.90% who were 65 years of age or older. The median age was 40 years. For every 100 females there were 91.70 males. For every 100 females age 18 and over, there were 88.10 males. The median income for a household in the county was $39,047, and the median income for a family was $50,162. Males had a median income of $36,692 versus $26,504 for females. The per capita income for the county was $21,807. About 6.50% of families and 9.50% of the population were below the poverty line, including 12.30% of those under age 18 and 7.20% of those age 65 or over. In the last two U.S. Presidential elections, Berkshire County was Massachusetts's second-bluest county behind Suffolk County, which consists primarily of Boston. In 2004, the Bay State's native son John Kerry carried Berkshire by a massive 47.4% margin over incumbent President George W. Bush, with Kerry winning his home state by 25.2% over President Bush. In 2008, the county voted for Barack Obama by an even wider 52.4% margin over John McCain, with Obama winning by 25.8% over McCain statewide. Berkshire County was originally inhabited by the Mahican (Muh-he-ka-neew) Native American tribe, until the early 18th century when the first English settlers and frontiersmen appeared around this time and began setting up farms and homesteads. On April 25, 1724 “The English finally paid the Indians 460 pounds, 3 barrels of cider, and 30 quarts of rum for what is today Berkshire County” (page 5. Wood, David H. Lenox Massachusetts Shire Town. Published by the town of Lenox, 1969). This deal exempted modern Sheffield, Stockbridge, Richmond and Lenox, which were collected at various other dates into English territory. In the 19th century many of the towns of Berkshire County became popular with the country's elite as they built what they called "cottages" throughout the country side. The Gilded Age ended in the early 20th century with the income tax, World War I, and the Great Depression. In the 20th century many of these cottages were torn or burned down, became prep schools, or were left uninhabited. Today the Berkshires is known throughout the East Coast and the country as the summer home of the Boston Symphony Orchestra. It's viewed as a place to relax, from Tanglewood to the Norman Rockwell museum. *: Villages are census divisions, but have no separate legal existence from the towns they are in. °: There is also a southern border with Dutchess County, New York, however this is in a forested area and there is no direct access to Berkshire County. This page uses content from the English language Wikipedia. The original content was at Berkshire County, Massachusetts. The list of authors can be seen in the page history. As with this Familypedia wiki, the content of Wikipedia is available under the Creative Commons License.